16 MMS October 2017 mmsonline.com MARK: MY WORD Commentary We Still Need Lean Lean manufacturing is more important than ever. This is so because many of the latest tools for discovering and remedying waste-causing conditions in manufacturing are digital. These tools enable shops to gather data from devices con- nected to a computer network and turn that data into actionable information. This information can be used to make better decisions about manufac- turing processes. Lean, however, teaches us that all of these decisions are ultimately about making those processes less wasteful and products more valuable to customers. Lean manufacturing and digital technology are moving in the same direction, with a common aim and purpose. If implementing lean practices can be described as a journey, then the route this journey takes should be in line with the path to data-driven manufacturing. Digital technology enables lean, while lean methodology is the steer- ing mechanism that keeps digitalization on course. Lean seeks to connect plant floor operations to customer demand as the force that pulls work through a continuous flow. Digital connections can unify, automate and streamline this flow, but the link to the customer is the critical element. A digi- tal thread not tied to customer satisfaction or the end user's experience is pointless. 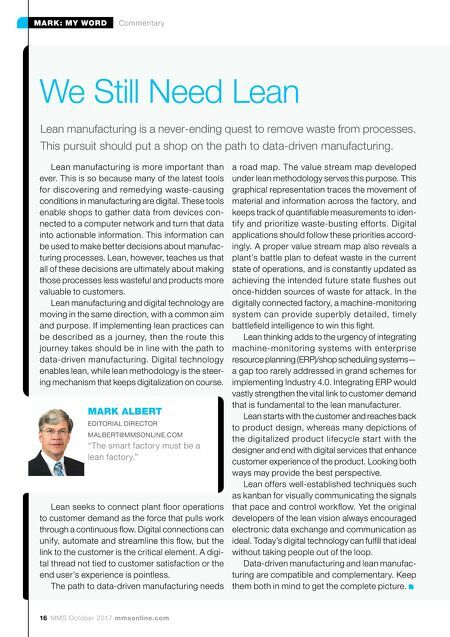 The path to data-driven manufacturing needs Lean manufacturing is a never-ending quest to remove waste from processes. This pursuit should put a shop on the path to data-driven manufacturing. a road map. The value stream map developed under lean methodology serves this purpose. This graphical representation traces the movement of material and information across the factory, and keeps track of quantifiable measurements to iden- tify and prioritize waste-busting efforts. Digital applications should follow these priorities accord- ingly. A proper value stream map also reveals a plant's battle plan to defeat waste in the current state of operations, and is constantly updated as achieving the intended future state flushes out once-hidden sources of waste for attack. In the digitally connected factory, a machine-monitoring system can provide superbly detailed, timely battlefield intelligence to win this fight. Lean thinking adds to the urgency of integrating machine-monitoring systems with enterprise resource planning (ERP)/shop scheduling systems— a gap too rarely addressed in grand schemes for implementing Industry 4.0. Integrating ERP would vastly strengthen the vital link to customer demand that is fundamental to the lean manufacturer. Lean starts with the customer and reaches back to product design, whereas many depictions of the digitalized product lifecycle star t with the designer and end with digital services that enhance customer experience of the product. Looking both ways may provide the best perspective. Lean offers well-established techniques such as kanban for visually communicating the signals that pace and control workflow. Yet the original developers of the lean vision always encouraged electronic data exchange and communication as ideal. Today's digital technology can fulfill that ideal without taking people out of the loop. 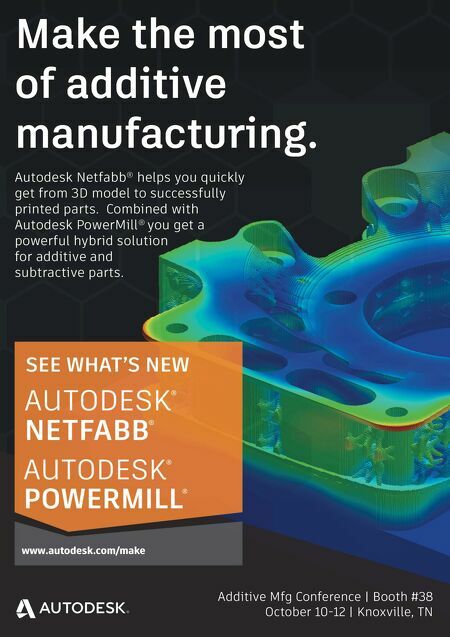 Data-driven manufacturing and lean manufac- turing are compatible and complementary. Keep them both in mind to get the complete picture. MARK ALBERT EDITORIAL DIRECTOR MALBERT@MMSONLINE.COM "The smart factory must be a lean factory."